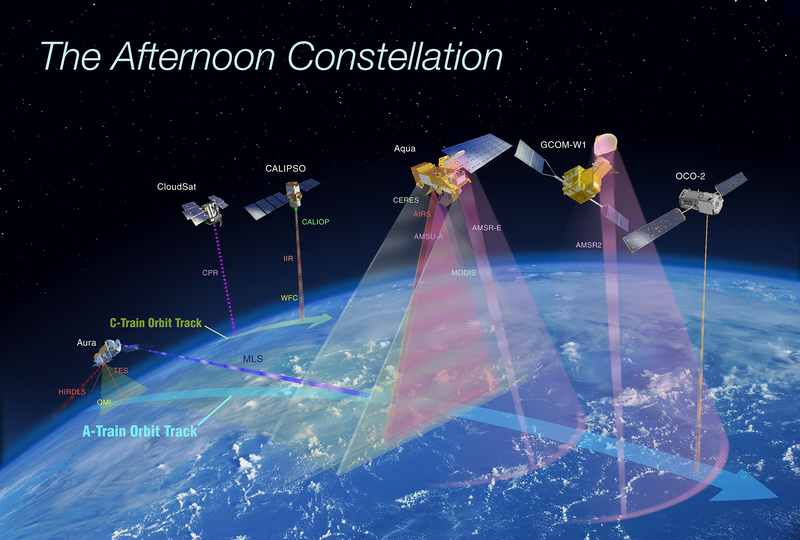 The international Afternoon Constellation includes the A-Train satellites (OCO-2, GCOM-W1, Aqua, and Aura) as well as the C-Train satellites (CALIPSO and CloudSat). Active instruments aboard CALIPSO (CALIOP) and CloudSat (CPR) are indicated with dashed lines. This illustration color-codes instrument swaths—the area of Earth’s surface, or the surface of its atmosphere, over which data are collected—based on observed wavelength ranges. Microwaves (observed by both AMSR instruments, AMSU-A, CPR, MLS) are represented as red-purple to deep purple colors; yellow represents solar wavelengths (OMI, OCO-2); gray represents solar and infrared wavelengths (MODIS, CERES); and red represents other infrared wavelengths (IIR, AIRS, TES, HIRDLS). Note that not all instruments continue to function (see https://atrain.gsfc.nasa.gov/atrainsats.php for updates). NASA and its international partners operate several Earth-observing satellites that closely follow one another along the same (or very similar) orbital “track.” A particular example of a coordinated group of satellites are in a sun-synchronous polar orbit, crossing the equator in an ascending (northbound) direction at about 1:30 PM local solar time, within seconds to minutes of each other—hence the name Afternoon Constellation. This allows near-simultaneous observations from a wide variety of instruments that are synergistically used to aid the scientific community in advancing our knowledge of Earth-system science and applying this knowledge for the benefit of society. The original Afternoon Constellation comprised a single set of coordinated satellites, that began in earnest in 2006 when CloudSat and CALIPSO joined in orbit with the Aqua (launched in 2002), Aura (2004), and PARASOL (2004) satellites. The constellation was nicknamed the “A-Train” because satellite names starting with an “A” led and trailed the constellation at the time. The train was later expanded with the inclusion of GCOM-W1 (2012) and OCO-2 (2014). On November 16, 2011, PARASOL was lowered to 9.5 km under the A-Train and on December 18, 2013 PARASOL ceased operation, fully exiting the A-Train. In February 2018, CloudSat lowered its orbit out of the A-Train after technical issues that potentially affected the satellite’s maneuvering capability. In September 2018, CALIPSO executed a series of maneuvers to join CloudSat’s orbit. Therefore, as depicted above, the international Afternoon Constellation now includes the A-Train satellites (OCO-2, GCOM-W1, Aqua, and Aura) as well as the C-Train satellites (“C” for CALIPSO and CloudSat). The C-Train flies 16.5 km (~10 mi) below the A-Train and therefore follows a slightly different ground track, though it intersects the A-Train ground track about every 20 days allowing for regular simultaneity between A-Train and C-Train instrument observations. The instruments on these satellites are used synergistically to improve our knowledge of clouds, aerosols, atmospheric chemistry, and other elements critical for understanding Earth’s environment and changing climate. Please use the tabbed menu above to learn more about the individual satellite missions involved with the A-Train Constellation. Aqua is a major international Earth Science satellite mission centered at NASA. Launched on May 4, 2002, the satellite has six differrent Earth-observing instruments on board and is named for the large amount of information it collects about water in the Earth system. Aqua gathers this information from its stream of approximately 89 Gigabytes of data a day! The water variables being measured include almost all elements of the water cycle and involve water in its liquid, solid, and vapor forms. Additional variables being measured include radiative energy fluxes, aerosols, vegetation cover on the land, phytoplankton and dissolved organic matter in the oceans, and air, land, and water temperatures. To learn more see Aqua's excerpt from the Earth Science Reference Handbook. To learn more see Aura's excerpt from the Earth Science Reference Handbook. Is the stratospheric ozone layer recovering? What are the processes controlling air quality? The French Space Agency CNES launched PARASOL into the A-Train orbit in December 2004. Originally designed to be a 2-year mission, PARASOL flew within ~30 seconds of the CALIPSO and CloudSat satellites. In early December 2009, the PARASOL satellite orbit was lowered under the A-train, which allowed the spacecraft to keep sharing data periodically with the A-train members. PARASOL ceased operation and fully exited the A-Train on December 18, 2013. CALIPSO is a joint U.S. (NASA) / French (Centre National d'Etudes Spatiales/CNES) mission. Observations from spaceborne lidar, combined with passive imagery, will lead to improved understanding of the role aerosols and clouds play in regulating the Earth's climate, in particular, how aerosols and clouds interact with one another. To learn more see Cloud-Aerosol Lidar and Infrared Pathfinder Satellite Observation (CALIPSO)'s excerpt from the Earth Science Reference Handbook. CloudSat is studying clouds in detail to better characterize the role they play in regulating Earth's climate. CloudSat is providing the first direct, global survey of the vertical structure and overlap of cloud systems and their liquid and ice-water contents.Data returned should lead to improved cloud representations in atmospheric models, which should help improve the accuracy of weather forecasts and climate predictions made using these models. To learn more see CloudSat's excerpt from the Earth Science Reference Handbook. The Global Change Observation Mission-Water (GCOM-W1) “SHIZUKU” satellite aims to construct, use, and verify systems that enable continuous global-scale observations (for 10 to 15 years) of effective geophysical parameters for elucidating global climate change and water circulation mechanisms. GCOM-W1 successfully entered the A-Train on June 29, 2012, following its launch on May 18. Water circulation changes will be observed by a microwave radiometer onboard the GCOM-W1 satellite. The GCOM-W1 will observe precipitation, vapor amounts, wind velocity above the ocean, sea water temperatures, water levels on land areas and snow depths. OCO-2 is designed to provide space-based global measurements of atmospheric carbon dioxide (CO2) with the precision and resolution needed to identify and characterize the processes that regulate this important greenhouse gas. With its three high-resolution grating spectrometers, data collected by OCO-2 could be combined with meteorological observations and ground-based CO2 measurement to help characterize CO2 sources and sinks on regional scales at monthly intervals for 2 years. To learn more see Orbiting Carbon Observatory 2 (OCO-2)'s excerpt from the Earth Science Reference Handbook. The image below reveals where Glory would have flown as part of the A-Train constellation, one minute behind CALIPSO. To learn more about Glory, see Glory's excerpt from the Earth Science Reference Handbook. CloudSat and CALIPSO have taken simultaneous measurements within seconds of each other since they launched together in April 2006. However, on February 22, 2018, CloudSat exited the A-Train following the loss of one of its reaction wheels. CloudSat resumed taking data in the Daytime-Only Operations (DO-Op) mode from a “C-Train” orbit located 16.5 km (~10 mi) below the A-Train on May 7, 2018. Following science recommendation, the decision was made for CALIPSO to join CloudSat in the “C-Train” orbit to resume the joint CALIPSO/CloudSat measurement record. CALIPSO exited the A-Train on September 13, 2018 and joined CloudSat in orbit on September 20, 2018. Since CALIPSO experiences about twice as much drag as CloudSat, CloudSat will conduct periodic orbit lower maneuvers to maintain a 100s along-track offset with respect to CALIPSO. This positioning will be maintained within about ±8.5 seconds, or about 4km of ground track offset, from CALIPSO. While the orbits of the A-Train and C-Train follow slightly different ground tracks due to differences in altitude, the two constellation tracks intersect each other about every 20 days. This allows simultaneous A-Train/C-Train instrument measurements on a regular basis. NASA’s Orbiting Carbon Observatory-2 (OCO-2), launched on July 2, 2014, was the final member to join the Afternoon Constellation, or A-Train. The spacecraft is positioned at the front of the A-Train, flying in a sun-synchronous orbit that over flies the ground track of the CloudSat radar and CALIPSO lidar. The Afternoon Constellation or “A-Train” welcomed a new member on June 29, 2012 — the Global Change Observation Mission–Water (GCOM-W1) “SHIZUKU” satellite — which was launched by the Japan Aerospace Exploration Agency (JAXA) on May 18. SHIZUKU successfully executed a series of orbit control maneuvers required to position itself in its control box. It is now positioned in front of Aqua, making it the lead satellite in the constellation. On July 3, 2012, the antenna rotation on the Advanced Microwave Scanning Radiometer 2 (AMSR2), on SHIZUKU, was increased from a rate of 11 rpm to 40 rpm and it is not acquiring observation data. Aura is NASA’s third large Earth Observing System mission and is dedicated to understanding the changing chemistry of our atmosphere. 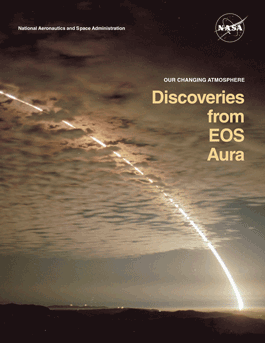 View the latest brochure highlighting some of the discoveries from the Aura Mission.